The Micro is a microcontroller board based on the ATmega32U4, developed in conjunction with Adafruit. It has 20 digital input/output pins (of which 7 can be used as PWM outputs and 12 as analog inputs), a 16 MHz crystal oscillator, a micro USB connection, an ICSP header, and a reset button. It contains everything needed to support the microcontroller; simply connect it to a computer with a micro USB cable to get started. It has a form factor that enables it to be easily placed on a breadboard. 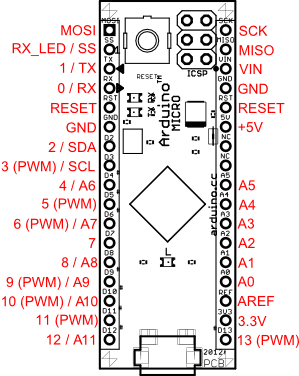 The Micro board can be programmed with the Arduino Software (IDE). Select "Arduino/Genuino Micro from the Tools > Board menu. For details, see the reference and tutorials. The ATmega32U4 on the Micro comes preprogrammed with a bootloader that allows you to upload new code to it without the use of an external hardware programmer. It communicates using the AVR109 protocol. The Micro can be powered via the micro USB connection or with an external power supply. The power source is selected automatically. VI. The input voltage to the MICRO board when it's using an external power source (as opposed to 5 volts from the USB connection or other regulated power source). You can supply voltage through this pin. Each of the 20 digital i/o pins on the Micro can be used as an input or output, using pinMode(), digitalWrite(), and digitalRead() functions. They operate at 5 volts. Each pin can provide or receive 20 mA as recommended operating condition and has an internal pull-up resistor (disconnected by default) of 20-50 k ohm. A maximum of 40mA is the value that must not be exceeded to avoid permanent damage to the microcontroller. External Interrupts: 0(RX), 1(TX), 2, 3 and 7. These pins can be configured to trigger an interrupt on a low value, a rising or falling edge, or a change in value. See the attachInterrupt() function for details. SPI: on the ICSP header. These pins support SPI communication using the SPI library. Note that the SPI pins are not connected to any of the digital I/O pins as they are on the Uno, they are only available on the ICSP connector and on the nearby pins labelled MISO, MOSI and SCK. RX_LED/SS This is an additional pin compared to the Leonardo. It is connected to the RX_LED that indicates the activity of transmission during USB communication, but is can also used as slave select pin (SS) in SPI communication. The Micro has a number of facilities for communicating with a computer, another board of the Arduino & Genuino family, or other microcontrollers. The 32U4 provides UART TTL (5V) serial communication, which is available on digital pins 0 (RX) and 1 (TX). The ATmega32U4 also allows for serial (CDC) communication over USB and appears as a virtual com port to software on the computer. The chip also acts as a full speed USB 2.0 device, using standard USB COM drivers. On Windows, a .inf file is required . The Arduino Software (IDE) includes a serial monitor which allows simple textual data to be sent to and from the board. The RX and TX LEDs on the board will flash when data is being transmitted via the USB connection to the computer (but not for serial communication on pins 0 and 1). A SoftwareSerial library allows for serial communication on other Micro's digital pins. The ATmega32U4 also supports I2C (TWI) and SPI communication. The Arduino Software (IDE) includes a Wire library to simplify use of the I2C bus; see the documentation for details. For SPI communication, use the SPI library. Rather than requiring a physical press of the reset button before an upload, the Micro board is designed in a way that allows it to be reset by software running on a connected computer. The reset is triggered when the Micro's virtual (CDC) serial / COM port is opened at 1200 baud and then closed. When this happens, the processor will reset, breaking the USB connection to the computer (meaning that the virtual serial / COM port will disappear). After the processor resets, the bootloader starts, remaining active for about 8 seconds. The bootloader can also be initiated by pressing the reset button on the Micro. Note that when the board first powers up, it will jump straight to the user sketch, if present, rather than initiating the bootloader. Because of the way the Micro handles reset it's best to let the Arduino Software (IDE) try to initiate the reset before uploading, especially if you are in the habit of pressing the reset button before uploading on other boards. If the software can't reset the board, you can always start the bootloader by pressing the reset button on the board.